Earlier this month Vogue Australia contacted us for permission to use two of our fabulous Josef Albers prints for their January 2013 issue. 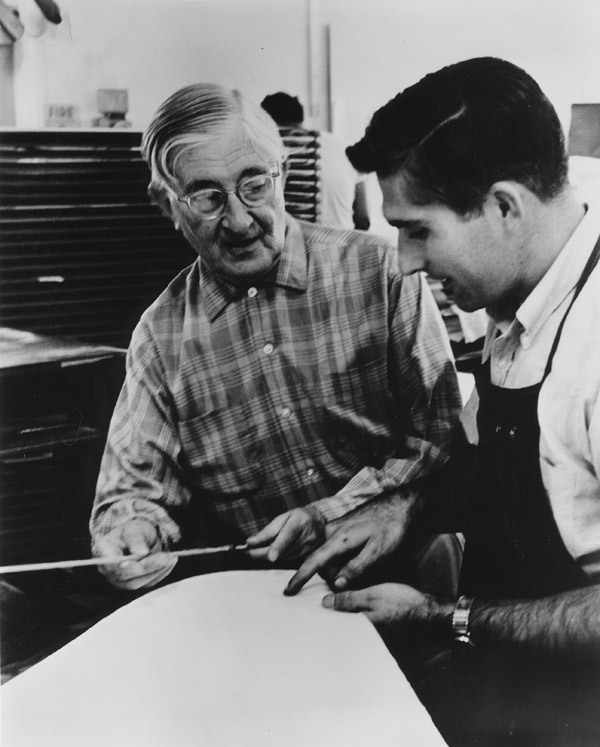 This got us thinking about the unique relationship that Kenneth Tyler shared with Albers, and below we have compiled some candid shots to accompany a brief history of the artist and master printer’s working relationship. Tyler and Albers first worked together at the Tamarind Lithography Workshop. 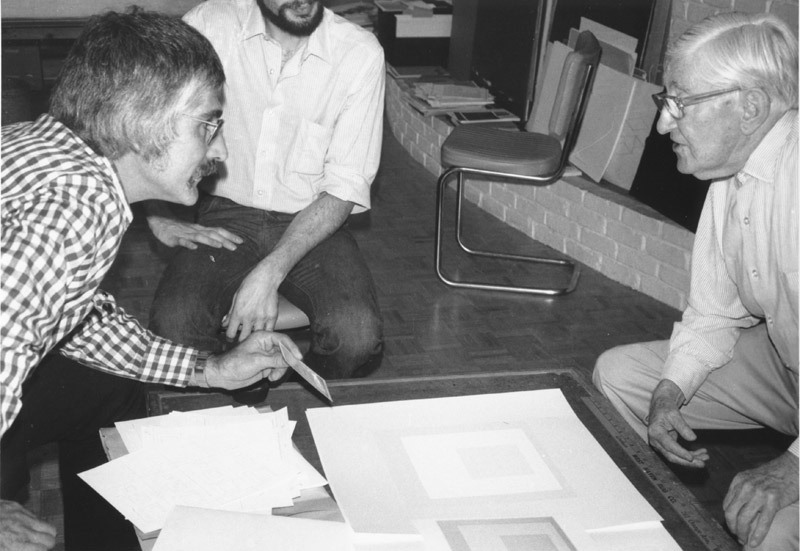 When Tyler moved to Los Angeles in 1965 to set up his own print workshop and publishing house – Gemini GEL – Albers’ White line squares was the first print project. 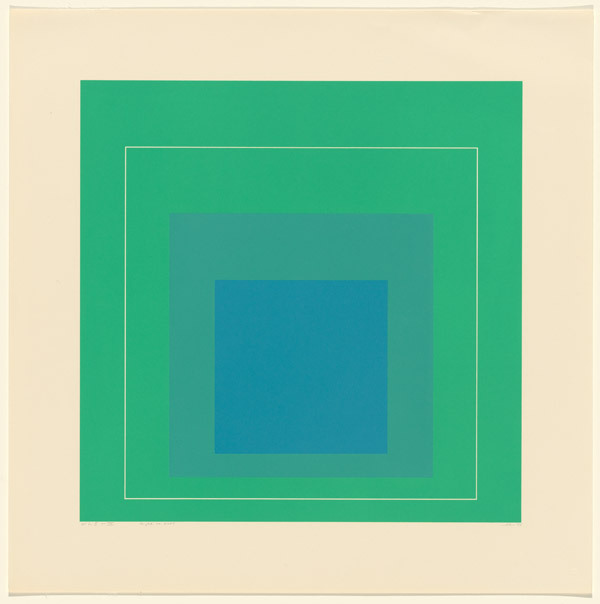 This series develops Albers’ colour theories and his unique application of the colour spectrum to images of geometric abstraction. The addition of a precise, white line creates the appearance of four-colours, although only three inks are used. 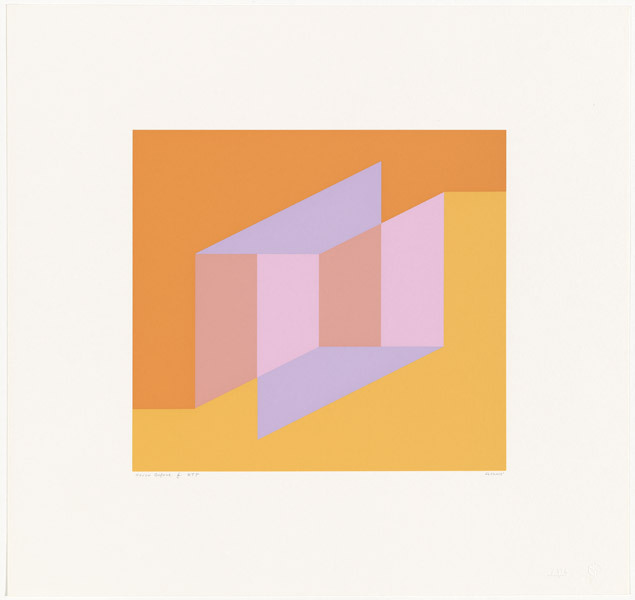 The perfectly registered, luminous lithographs became Tyler’s ‘calling card’ to attract other major artists to the studio, and Albers generously donated a large percentage of the proceeds to fund further projects. 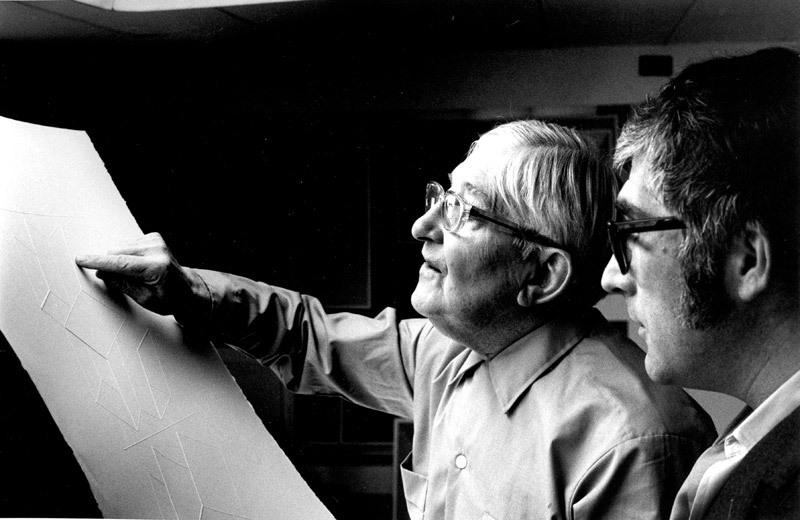 When, in 1973, Tyler moved to the east coast to establish Tyler Graphics Ltd in BedfordVillage, the inaugural project was again devoted to Albers. Gray instrumentation I, a portfolio of colour screenprints interspersed with text pages written by Albers, was produced in 1974. The series was a remarkable feat, achieving a level of precision that had not been seen in screen-printing before. The crisp, clear colours were inspired by leaves, twigs, scraps of paper and other found materials that Albers requested Tyler match in ink, exactly. The subtle tonal differences in each print required hours of laboured colour-proofing: each of the inks was printed directly onto white paper with no overlap or overprinting. The exercise required a perfect system of colour-matching and a perfect system of registration, which Tyler turned to photographic techniques to achieve. In the two years that followed, Tyler and Albers collaborated on three further screenprint portfolios: Gray instrumentation II; Mitered squares; and Never before. 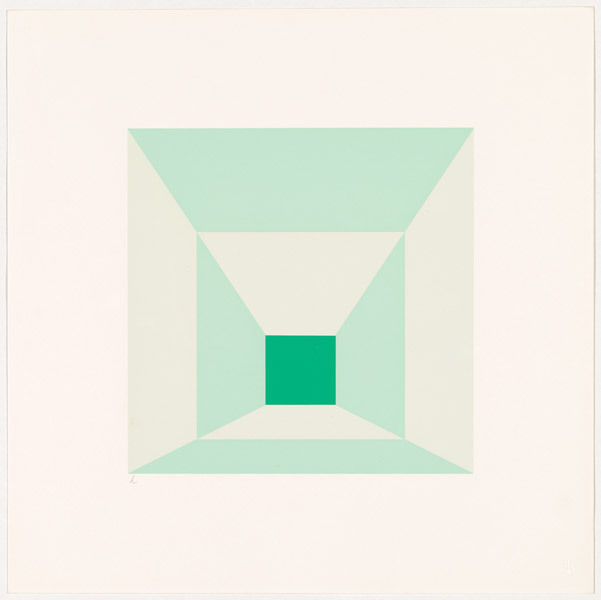 Never before, which develops ideas that Albers had started exploring twenty-seven years earlier in the 1949 painting Indicating solids, was completed in 1976, just weeks before his death.